For other uses, see Druid (disambiguation). A druid (Welsh: derwydd; Old Irish: druí; Scottish Gaelic: draoidh) was a member of the high-ranking professional class in ancient Celtic cultures. Perhaps best remembered as religious leaders, they were also legal authorities, adjudicators, lorekeepers, medical professionals, and political advisors. While the druids are reported to have been literate, they are believed to have been prevented by doctrine from recording their knowledge in written form, thus they left no written accounts of themselves. They are however attested in some detail by their contemporaries from other cultures, such as the Romans and the Greeks. The earliest known references to the druids date to the fourth century BCE and the oldest detailed description comes from Julius Caesar's Commentarii de Bello Gallico (50s BCE). They were also described by later Greco-Roman writers such as Cicero, Tacitus, and Pliny the Elder. Following the Roman invasion of Gaul, the druid orders were suppressed by the Roman government under the 1st century CE emperors Tiberius and Claudius, and had disappeared from the written record by the 2nd century. In about 750 CE the word druid appears in a poem by Blathmac, who wrote about Jesus, saying that he was "... better than a prophet, more knowledgeable than every druid, a king who was a bishop and a complete sage." The druids then also appear in some of the medieval tales from Christianized Ireland like the "Táin Bó Cúailnge", where they are largely portrayed as sorcerers who opposed the coming of Christianity. In the wake of the Celtic revival during the 18th and 19th centuries, fraternal and neopagan groups were founded based on ideas about the ancient druids, a movement known as Neo-Druidism. Many popular notions about druids, based on misconceptions of 18th century scholars, have been largely superseded by more recent study. The modern English word druid derives from the Latin druidēs (plural), which was considered by ancient Roman writers to come from the native Celtic Gaulish word for these figures. Other Roman texts also employ the form druidae, while the same term was used by Greek ethnographers as δρυΐδης (druidēs). Although no extant Romano-Celtic inscription is known to contain the form, the word is cognate with the later insular Celtic words, Old Irish druí ‘druid, sorcerer’, Old Cornish druw, Middle Welsh dryw ‘seer; wren’. Based on all available forms, the hypothetical proto-Celtic word may then be reconstructed as *dru-wid-s (pl. *druwides) meaning "oak-knower". The two elements go back to the Proto-Indo-European roots *deru- and *weid- "to see". The sense of "oak-knower" or "oak-seer" is supported by Pliny the Elder, who in his Natural History considered the word to contain the Greek noun drýs (δρύς), "oak-tree" and the Greek suffix -idēs (-ιδης). Both Old Irish druí and Middle Welsh dryw could also refer to the wren, possibly connected with an association of that bird with augury in Irish and Welsh tradition (see also Wren Day). Sources by ancient and medieval writers provide an idea of the religious duties and social roles involved in being a druid. The Greco-Roman and the vernacular Irish sources agree that the druids played an important part in pagan Celtic society. In his description, Julius Caesar claimed that they were one of the two most important social groups in the region (alongside the equites, or nobles) and were responsible for organizing worship and sacrifices, divination, and judicial procedure in Gaulish, British, and Irish societies. [not in citation given] He also claimed that they were exempt from military service and from the payment of taxes, and had the power to excommunicate people from religious festivals, making them social outcasts. 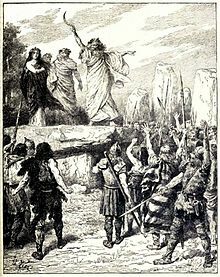 Two other classical writers, Diodorus Siculus and Strabo, also wrote about the role of druids in Gallic society, claiming that the druids were held in such respect that if they intervened between two armies they could stop the battle. 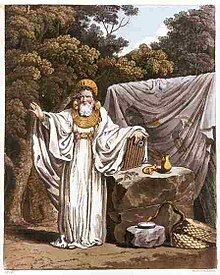 Pomponius Mela is the first author who says that the druids' instruction was secret and took place in caves and forests. Druidic lore consisted of a large number of verses learned by heart, and Caesar remarked that it could take up to twenty years to complete the course of study. What was taught to druid novices anywhere is conjecture: of the druids' oral literature, not one certifiably ancient verse is known to have survived, even in translation. All instruction was communicated orally, but for ordinary purposes, Caesar reports, the Gauls had a written language in which they used Greek characters. In this he probably draws on earlier writers; by the time of Caesar, Gaulish inscriptions had moved from the Greek script to the Latin script. An 18th century illustration of a wicker man, the form of execution that Caesar claimed the druids used for human sacrifice. From the "Duncan Caesar", Tonson, Draper, and Dodsley edition of the Commentaries of Caesar translated by William Duncan published in 1753. Greek and Roman writers frequently made reference to the druids as practitioners of human sacrifice. According to Caesar, those who had been found guilty of theft or other criminal offences were considered preferable for use as sacrificial victims, but when criminals were in short supply, innocents would be acceptable. A form of sacrifice recorded by Caesar was the burning alive of victims in a large wooden effigy, now often known as a wicker man. A differing account came from the 10th-century Commenta Bernensia, which claimed that sacrifices to the deities Teutates, Esus and Taranis were by drowning, hanging and burning, respectively (see threefold death). "These men predict the future by observing the flight and calls of birds and by the sacrifice of holy animals: all orders of society are in their power... and in very important matters they prepare a human victim, plunging a dagger into his chest; by observing the way his limbs convulse as he falls and the gushing of his blood, they are able to read the future." There is archaeological evidence from western Europe that has been widely used to back up the idea that human sacrifice was performed by the Iron Age Celts. Mass graves found in a ritual context dating from this period have been unearthed in Gaul, at both Gournay-sur-Aronde and Ribemont-sur-Ancre in what was the region of the Belgae chiefdom. The excavator of these sites, Jean-Louis Brunaux, interpreted them as areas of human sacrifice in devotion to a war god, although this view was criticized by another archaeologist, Martin Brown, who believed that the corpses might be those of honoured warriors buried in the sanctuary rather than sacrifices. Some historians have questioned whether the Greco-Roman writers were accurate in their claims. J. Rives remarked that it was "ambiguous" whether the druids ever performed such sacrifices, for the Romans and Greeks were known to project what they saw as barbarian traits onto foreign peoples including not only druids but Jews and Christians as well, thereby confirming their own "cultural superiority" in their own minds. Nora Chadwick, an expert in medieval Welsh and Irish literature who believed the druids to be great philosophers, has also supported the idea that they had not been involved in human sacrifice, and that such accusations were imperialist Roman propaganda. "The Pythagorean doctrine prevails among the Gauls' teaching that the souls of men are immortal, and that after a fixed number of years they will enter into another body." With regard to their actual course of studies, the main object of all education is, in their opinion, to imbue their scholars with a firm belief in the indestructibility of the human soul, which, according to their belief, merely passes at death from one tenement to another; for by such doctrine alone, they say, which robs death of all its terrors, can the highest form of human courage be developed. Subsidiary to the teachings of this main principle, they hold various lectures and discussions on astronomy, on the extent and geographical distribution of the globe, on the different branches of natural philosophy, and on many problems connected with religion. Diodorus Siculus, writing in 36 BCE, described how the druids followed "the Pythagorean doctrine", that human souls "are immortal and after a prescribed number of years they commence a new life in a new body." In 1928, folklorist Donald A. Mackenzie speculated that Buddhist missionaries had been sent by the Indian king Ashoka. Others have invoked common Indo-European parallels. Caesar noted the druidic doctrine of the original ancestor of the tribe, whom he referred to as Dispater, or Father Hades. Druids also play a prominent role in Irish Folklore, generally serving lords and kings as high ranking priest-counselors with the gift of prophecy and other assorted mystical abilities - the best example of these possibly being Cathbad. The chief druid in the court of King Conchobar mac Nessa of Ulster, Cathbad features in several tales, most of which detail his ability to foretell the future. In the tale of Deirdre of the Sorrows – the foremost tragic heroine of the Ulster Cycle – the druid prophesied before the court of Conchobar that Deirdre would grow up to be very beautiful, but that kings and lords would go to war over her, much blood would be shed because of her, and Ulster's three greatest warriors would be forced into exile for her sake. This prophecy, ignored by the king, came true. Arguably the greatest of these mythological druids was Amergin Glúingel, a bard and judge for the Milesians featured in the Mythological Cycle. The Milesians were seeking to overrun the Tuatha De Danann and win the land of Ireland but, as they approached, the druids of the Tuatha Dé Danann raised a magical storm to bar their ships from making landfall. Thus Amergin called upon the spirit of Ireland itself, chanting a powerful incantation that has come to be known as The Song of Amergin and, eventually (after successfully making landfall), aiding and dividing the land between his royal brothers in the conquest of Ireland, earning the title Chief Ollam of Ireland. Other such mythological druids were Tadg mac Nuadat of the Fenian Cycle, and Mug Ruith, a powerful blind druid of Munster. Irish mythology has a number of female druids as well, often sharing similar prominent cultural and religious roles with their male counterparts. The Irish have several words for female druids, such as bandruí ("woman-druid"), found in tales such as the Táin Bó Cúailnge; Bodhmall, featured in the Fenian Cycle, and one of Fionn mac Cumhaill's childhood caretakers; and Tlachtga, the daughter of the druid Mug Ruith who, according to Irish tradition, is associated with the Hill of Ward, site of prominent festivals held in Tlachtga's honour during the Middle Ages. Biróg, another bandrúi of the Tuatha De Danann, plays a key role in an Irish folktale where the Fomorian warrior Balor attempts to thwart a prophecy foretelling that he would be killed by his own grandson by imprisoning his only daughter Eithne in the tower of Tory Island, away from any contact with men. Bé Chuille – daughter of the woodland goddess Flidais and sometimes described as a sorceress rather than a bandruí – features in a tale from the Metrical Dindshenchas where she joins three other of the Tuatha Dé to defeat the evil Greek witch Carman. Other bandrúi include Relbeo, a Nemedian druid who appears in The Book of Invasions, where she is described as the daughter of the King of Greece and mother of Fergus Lethderg and Alma One-Tooth. Dornoll was a bandrúi in Scotland, who normally trained heroes in warfare, particularly Laegaire and Conall; she was the Daughter of Domnall Mildemail. "Sena, in the Britannic Sea, opposite the coast of the Osismi, is famous for its oracle of a Gaulish god, whose priestesses, living in the holiness of perpetual virginity, are said to be nine in number. They call them Gallizenae, and they believe them to be endowed with extraordinary gifts to rouse the sea and the wind by their incantations, to turn themselves into whatsoever animal form they may choose, to cure diseases which among others are incurable, to know what is to come and to foretell it. They are, however; devoted to the service of voyagers only who have set out on no other errand than to consult them." The earliest surviving literary evidence of the druids emerges from the classical world of Greece and Rome. The archaeologist Stuart Piggott compared the attitude of the Classical authors towards the druids as being similar to the relationship that had existed in the 15th and 18th centuries between Europeans and the societies that they were just encountering in other parts of the world, such as the Americas and the South Sea Islands. In doing so, he highlighted that both the attitude of the Early Modern Europeans and the Classical authors was that of "primitivism", viewing these newly encountered societies as primitive because of their lesser technological development and perceived backwardness in socio-political development. The historian Nora Chadwick, in a categorization subsequently adopted by Piggott, divided the Classical accounts of the druids into two groups, distinguished by their approach to the subject as well as their chronological contexts. She refers to the first of these groups as the "Posidonian" tradition after one of its primary exponents, Posidonious, and notes that it takes a largely critical attitude towards the Iron Age societies of Western Europe that emphasizes their "barbaric" qualities. The second of these two groups is termed the "Alexandrian" group, being centred on the scholastic traditions of Alexandria in Egypt; she notes that it took a more sympathetic and idealized attitude towards these foreign peoples. Piggott drew parallels between this categorisation and the ideas of "hard primitivism" and "soft primitivism" identified by historians of ideas A.O. Lovejoy and Franz Boas. One school of thought within historical scholarship has suggested that all of these accounts are inherently unreliable, and might be entirely fictional. They have suggested that the idea of the druid might have been a fiction created by Classical writers to reinforce the idea of the barbaric "other" who existed beyond the civilized Greco-Roman world, thereby legitimising the expansion of the Roman Empire into these areas. The earliest record of the druids comes from two Greek texts of c. 300 BCE: one, a history of philosophy written by Sotion of Alexandria, and the other a study of magic widely attributed to Aristotle. Both texts are now lost, but were quoted in the 2nd century CE work Vitae by Diogenes Laërtius. Some say that the study of philosophy originated with the barbarians. In that among the Persians there existed the Magi, and among the Babylonians or Assyrians the Chaldaei, among the Indians the Gymnosophistae, and among the Celts and Gauls men who were called druids and semnothei, as Aristotle relates in his book on magic, and Sotion in the twenty-third book of his Succession of Philosophers. Subsequent Greek and Roman texts from the third century BCE refer to "barbarian philosophers", possibly in reference to the Gaulish druids. The earliest extant text that describes the druids in detail is Julius Caesar's Commentarii de Bello Gallico, book VI, written in the 50s or 40s BCE. A military general who was intent on conquering Gaul and Britain, Caesar described the druids as being concerned with "divine worship, the due performance of sacrifices, private or public, and the interpretation of ritual questions." He claimed that they played an important part in Gaulish society, being one of the two respected classes along with the equites (in Rome the name for members of a privileged class above the common people, but also "horsemen") and that they performed the function of judges. He claimed that they recognized the authority of a single leader, who would rule until his death, when a successor would be chosen by vote or through conflict. He also remarked that they met annually at a sacred place in the region occupied by the Carnute tribe in Gaul, while they viewed Britain as the centre of druidic study; and that they were not found amongst the German tribes to the east of the Rhine. According to Caesar, many young men were trained to be druids, during which time they had to learn all the associated lore by heart. He also claimed their main teaching was "the souls do not perish, but after death pass from one to another". They were also concerned with "the stars and their movements, the size of the cosmos and the earth, the world of nature, and the power and might of the immortal gods", indicating they were involved with not only such common aspects of religion as theology and cosmology, but also astronomy. 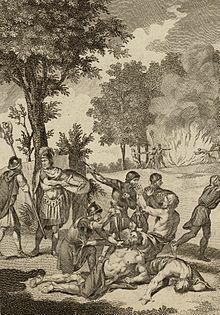 Caesar also held that they were "administrators" during rituals of human sacrifice, for which criminals were usually used, and that the method was through burning in a wicker man. Although he had first-hand experience of Gaulish people, and therefore likely with druids, Caesar's account has been widely criticized by modern historians as inaccurate. One issue raised by such historians as Fustel de Coulanges was that while Caesar described the druids as a significant power within Gaulish society, he did not mention them even once in his accounts of his Gaulish conquests. Nor did Aulus Hirtius, who continued Caesar's account of the Gallic Wars following Caesar's death. Hutton believed that Caesar had manipulated the idea of the druids so they would appear both civilized (being learned and pious) and barbaric (performing human sacrifice) to Roman readers, thereby representing both "a society worth including in the Roman Empire" and one that required civilizing with Roman rule and values, thus justifying his wars of conquest. Sean Dunham suggested that Caesar had simply taken the Roman religious functions of senators and applied them to the druids. Daphne Nash believed it "not unlikely" that he "greatly exaggerates" both the centralized system of druidic leadership and its connection to Britain. Other historians have accepted that Caesar's account might be more accurate. Norman J. DeWitt surmised that Caesar's description of the role of druids in Gaulish society may report an idealized tradition, based on the society of the 2nd century BCE, before the pan-Gallic confederation led by the Arverni was smashed in 121 BCE, followed by the invasions of Teutones and Cimbri, rather than on the demoralized and disunited Gaul of his own time. John Creighton has speculated that in Britain, the druidic social influence was already in decline by the mid-1st century BCE, in conflict with emergent new power structures embodied in paramount chieftains. Other scholars see the Roman conquest itself as the main reason for the decline of the druid orders. Archaeologist Miranda Aldhouse-Green (2010) asserted that Caesar offered both “our richest textual source” regarding the druids, and “one of the most reliable.” She defended the accuracy of his accounts by highlighting that while he may have embellished some of his accounts to justify Roman imperial conquest, it was “inherently unlikely” that he constructed a fictional class system for Gaul and Britain, particularly considering that he was accompanied by a number of other Roman senators who would have also been sending reports on the conquest to Rome, and who would have challenged his inclusion of serious falsifications. Other classical writers also commented on the druids and their practices. Caesar's contemporary, Marcus Tullius Cicero, noted that he had met a Gallic druid, Divitiacus, who was a member of the Aedui tribe. Divitiacus supposedly knew much about the natural world and performed divination through augury. Whether Diviaticus was genuinely a druid can however be disputed, for Caesar also knew this figure, and also wrote about him, calling him by the more Gaulish-sounding (and thereby presumably the more authentic) Diviciacus, but never referred to him as a druid and indeed presented him as a political and military leader. Another classical writer to take up describing the druids not too long after was Diodorus Siculus, who published this description in his Bibliotheca historicae in 36 BCE. Alongside the druids, or as he called them, drouidas, whom he viewed as philosophers and theologians, he also remarked how there were poets and singers in Celtic society whom he called bardous, or bards. Such an idea was expanded on by Strabo, writing in the 20s CE, who declared that amongst the Gauls, there were three types of honoured figures: the poets and singers known as bardoi, the diviners and specialists in the natural world known as o'vateis, and those who studied "moral philosophy", the druidai. The Roman writer Tacitus, himself a senator and a historian, described how when the Roman army, led by Suetonius Paulinus, attacked the island of Mona (Anglesey, Ynys Môn in Welsh), the legionaries were awestruck on landing by the appearance of a band of druids, who, with hands uplifted to the sky, poured forth terrible imprecations on the heads of the invaders. He states that these "terrified our soldiers who had never seen such a thing before..." The courage of the Romans, however, soon overcame such fears, according to the Roman historian; the Britons were put to flight, and the sacred groves of Mona were cut down. Tacitus is also the only primary source that gives accounts of druids in Britain, but maintains a hostile point of view, seeing them as ignorant savages. During the Middle Ages, after Ireland and Wales were Christianized, druids appeared in a number of written sources, mainly tales and stories such as the Táin Bó Cúailnge, but also in the hagiographies of various saints. These were all written by Christian monks. In Irish-language literature, the druids — draoithe, plural of draoi— are sorcerers with supernatural powers, who are respected in society, particularly for their ability to perform divination. The Dictionary of the Irish Language defines druí (which has numerous variant forms, including draoi) as 'magician, wizard or diviner'. In the literature the druids cast spells and turn people into animals or stones, or curse peoples’ crops to be blighted. When druids are portrayed in early Irish sagas and saints' lives set in the pre-Christian past of the island, they are usually accorded high social status. The evidence of the law-texts, which were first written down in the 7th and 8th centuries, suggests that with the coming of Christianity the role of the druid in Irish society was rapidly reduced to that of a sorcerer who could be consulted to cast spells or practise healing magic and that his standing declined accordingly. According to the early legal tract Bretha Crólige, the sick-maintenance due to a druid, satirist and brigand (díberg) is no more than that due to a bóaire (an ordinary freeman). Another law-text, Uraicecht Becc (‘Small primer’), gives the druid a place among the dóer-nemed or professional classes which depend for their status on a patron, along with wrights, blacksmiths and entertainers, as opposed to the fili, who alone enjoyed free nemed-status. A pair of 1st-century BC (?) "spoons" from England. It is speculated that they were used for divination. Eleven such pairs are known. Miranda Green believes a liquid was put in the spoon with a hole, and allowed to drip into the other below, and the drip pattern interpreted. As the historian Jane Webster stated, "individual druids... are unlikely to be identified archaeologically". A.P. Fitzpatrick, in examining what he believed to be astral symbolism on Late Iron Age swords has expressed difficulties in relating any material culture, even the Coligny calendar, with druidic culture. Nonetheless, some archaeologists have attempted to link certain discoveries with written accounts of the druids. The archaeologist Anne Ross linked what she believed to be evidence of human sacrifice in Celtic pagan society—such as the Lindow Man bog body—to the Greco-Roman accounts of human sacrifice being officiated over by the druids. Miranda Aldhouse-Green, professor of archaeology at Cardiff University has noted that Suetonius's army would have passed very near the site whilst traveling to deal with Boudicca and postulates that the sacrifice may have been connected. An excavated burial in Deal, Kent discovered the "Deal Warrior" – a man buried around 200–150 BCE with a sword and shield, and wearing a unique crown, too thin to be a helmet. The crown is bronze with a broad band around the head and a thin strip crossing the top of the head. It was worn without any padding beneath, as traces of hair were left on the metal. The form of the crown is similar to that seen in images of Romano-British priests several centuries later, leading to speculation among archaeologists that the man might have been a druid. During the Gallic Wars of 58 to 51 BCE, the Roman army, led by Julius Caesar, conquered the many tribal chiefdoms of Gaul, and annexed it as a part of the Roman Republic. According to accounts produced in the following centuries, the new rulers of Roman Gaul subsequently introduced measures to wipe out the druids from that country. According to Pliny the Elder, writing in the 70s CE, it was the emperor Tiberius (who ruled from 14 to 37 CE), who introduced laws banning not only druid practices, but also other native soothsayers and healers, a move which Pliny applauded, believing that it would end human sacrifice in Gaul. A somewhat different account of Roman legal attacks on the druids was made by Suetonius, writing in the 2nd century CE, when he claimed that Rome's first emperor, Augustus (who had ruled from 27 BCE till 14 CE), had decreed that no-one could be both a druid and a Roman citizen, and that this was followed by a law passed by the later Emperor Claudius (who had ruled from 41 to 54 CE) which "thoroughly suppressed" the druids by banning their religious practices. The best evidence of a druidic tradition in the British Isles is the independent cognate of the Celtic *druwid- in Insular Celtic: The Old Irish druídecht survives in the meaning of 'magic', and the Welsh dryw in the meaning of 'seer'. While the druids as a priestly caste were extinct with the Christianization of Wales, complete by the 7th century at the latest, the offices of bard and of "seer" (Welsh: dryw) persisted in medieval Wales into the 13th century. Phillip Freeman, a classics professor, discusses a later reference to 'dryades', which he translates as 'druidesses', writing that "The fourth century A.D. collection of imperial biographies known as the Historia Augusta contains three short passages involving Gaulish women called 'dryades' ('druidesses'). He points out that "In all of these, the women may not be direct heirs of the druids who were supposedly extinguished by the Romans — but in any case they do show that the druidic function of prophesy continued among the natives in Roman Gaul." However, the Historia Augusta is frequently interpreted by scholars as a largely satirical work, and such details might have been introduced in a humorous fashion. Additionally, female druids are mentioned in later Irish mythology, including the legend of Fionn mac Cumhaill, who, according to the 12th century The Boyhood Deeds of Fionn, is raised by the woman druid Bodhmall and her companion, another wise-woman. The story of Vortigern, as reported by Nennius, provides one of the very few glimpses of possible druidic survival in Britain after the Roman conquest: unfortunately, Nennius is noted for mixing fact and legend in such a way that it is now impossible to know the truth behind his text. He wrote that after being excommunicated by Germanus, the British leader Vortigern invited twelve druids to assist him. In the lives of saints and martyrs, the druids are represented as magicians and diviners. In Adamnan's vita of Columba, two of them act as tutors to the daughters of Lóegaire mac Néill, the High King of Ireland, at the coming of Saint Patrick. They are represented as endeavouring to prevent the progress of Patrick and Saint Columba by raising clouds and mist. Before the battle of Culdremne (561) a druid made an airbe drtiad ("fence of protection"?) round one of the armies, but what is precisely meant by the phrase is unclear. The Irish druids seem to have had a peculiar tonsure. The word druí is always used to render the Latin magus, and in one passage St Columba speaks of Christ as his druid. Similarly, a life of St Beuno states that when he died he had a vision of 'all the saints and druids'. Sulpicius Severus' Vita of Martin of Tours relates how Martin encountered a peasant funeral, carrying the body in a winding sheet, which Martin mistook for some druidic rites of sacrifice, "because it was the custom of the Gallic rustics in their wretched folly to carry about through the fields the images of demons veiled with a white covering." So Martin halted the procession by raising his pectoral cross: "Upon this, the miserable creatures might have been seen at first to become stiff like rocks. Next, as they endeavoured, with every possible effort, to move forward, but were not able to take a step farther, they began to whirl themselves about in the most ridiculous fashion, until, not able any longer to sustain the weight, they set down the dead body." Then discovering his error, Martin raised his hand again to let them proceed: "Thus," the hagiographer points out, "he both compelled them to stand when he pleased, and permitted them to depart when he thought good." From the 18th century, England and Wales experienced a revival of interest in the druids. John Aubrey (1626–1697) had been the first modern writer to (incorrectly) connect Stonehenge and other megalithic monuments with the druids; since Aubrey's views were confined to his notebooks, the first wide audience for this idea were readers of William Stukeley (1687–1765). It is incorrectly believed that John Toland (1670–1722) founded the Ancient Druid Order however the research of historian Ronald Hutton has revealed that the ADO was founded by George Watson MacGregor Reid in 1909. The order never used (and still does not use) the title "ArchDruid" for any member, but falsely credited William Blake as having been its "Chosen Chief" from 1799 to 1827, without corroboration in Blake's numerous writings or among modern Blake scholars. Blake's bardic mysticism derives instead from the pseudo-Ossianic epics of Macpherson; his friend Frederick Tatham's depiction of Blake's imagination, "clothing itself in the dark stole of moral sanctity"— in the precincts of Westminster Abbey— "it dwelt amid the druid terrors", is generic rather than specifically neo-druidic. John Toland was fascinated by Aubrey's Stonehenge theories, and wrote his own book about the monument without crediting Aubrey. The roles of bards in 10th century Wales had been established by Hywel Dda and it was during the 18th century that the idea arose that druids had been their predecessors. The 19th-century idea, gained from uncritical reading of the Gallic Wars, that under cultural-military pressure from Rome the druids formed the core of 1st-century BCE resistance among the Gauls, was examined and dismissed before World War II, though it remains current in folk history. Druids began to figure widely in popular culture with the first advent of Romanticism. Chateaubriand's novel Les Martyrs (1809) narrated the doomed love of a druid priestess and a Roman soldier; though Chateaubriand's theme was the triumph of Christianity over pagan druids, the setting was to continue to bear fruit. Opera provides a barometer of well-informed popular European culture in the early 19th century: in 1817 Giovanni Pacini brought druids to the stage in Trieste with an opera to a libretto by Felice Romani about a druid priestess, La Sacerdotessa d'Irminsul ("The Priestess of Irminsul"). The most famous druidic opera, Vincenzo Bellini's Norma was a fiasco at La Scala, when it premiered the day after Christmas, 1831; but in 1833 it was a hit in London. For its libretto, Felice Romani reused some of the pseudo-druidical background of La Sacerdotessa to provide colour to a standard theatrical conflict of love and duty. 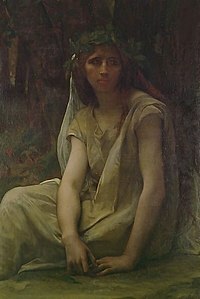 The story was similar to that of Medea, as it had recently been recast for a popular Parisian play by Alexandre Soumet: the chaste goddess (casta diva) addressed in Norma's hit aria is the moon goddess, worshipped in the "grove of the Irmin statue". 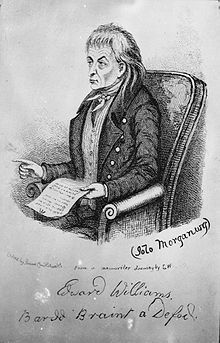 A central figure in 19th century Romanticist, Neo-druid revival, is the Welshman Edward Williams, better known as Iolo Morganwg. His writings, published posthumously as The Iolo Manuscripts (1849) and Barddas (1862), are not considered credible by contemporary scholars. Williams claimed to have collected ancient knowledge in a "Gorsedd of Bards of the Isles of Britain" he had organized. While bits and pieces of the Barddas still turn up in some "Neo-Druidic" works, the documents are not considered relevant to ancient practice by most scholars. Another Welshman, William Price (4 March 1800 – 23 January 1893), a physician known for his support of Welsh nationalism, Chartism, and his involvement with the Neo-Druidic religious movement, has been recognised as a significant figures of 19th-century Wales. He was arrested for cremating his deceased son, a practice he believed to be a druid ritual, but won his case; this in turn led to the 1902 cremation act. In 1927 T. D. Kendrick sought to dispel the pseudo-historical aura that had accrued to druids, asserting that "a prodigious amount of rubbish has been written about Druidism"; Neo-druidism has nevertheless continued to shape public perceptions of the historical druids. Some strands of contemporary Neo-Druidism are a continuation of the 18th-century revival and thus are built largely around writings produced in the 18th century and after by second-hand sources and theorists. Some are monotheistic. Others, such as the largest druid group in the world, The Order of Bards, Ovates and Druids draw on a wide range of sources for their teachings. Members of such Neo-Druid groups may be Neopagan, occultist, Christian or non-specifically spiritual. In the 20th century, as new forms of textual criticism and archaeological methods were developed, allowing for greater accuracy in understanding the past, various historians and archaeologists published books on the subject of the druids and came to their own conclusions. The archaeologist Stuart Piggott, author of The Druids (1968), accepted the Greco-Roman accounts and considered the druids to be a barbaric and savage priesthood who performed human sacrifices. This view was largely supported by another archaeologist, Anne Ross, author of Pagan Celtic Britain (1967) and The Life and Death of a Druid Prince (1989), although she believed that they were essentially tribal priests, having more in common with the shamans of tribal societies than with the classical philosophers. Ross' views were largely accepted by two other prominent archaeologists to write on the subject, Miranda Aldhouse-Green—author of The Gods of the Celts (1986), Exploring the World of the Druids (1997) and Caesar's Druids: Story of an Ancient Priesthood (2010)—and Barry Cunliffe, author of Iron Age Communities in Britain (1991) and The Ancient Celts (1997). ^ Antiquitas explanatione et schematibus illustrata vol. ii, part ii, book v. (p. 436). Montfaucon claims that he is reproducing a bas-relief found at Autun, Burgundy. ^ a b Cicero 44. I.XVI.90. ^ Mac Mathúna, Liam (1999) "Irish Perceptions of the Cosmos" Celtica, vol. 23 (1999), 174–187 (p. 181). ^ Hutton 2009. pp. 32–37. ^ "The Druids". The British Museum. Archived from the original on 2015-02-25. Retrieved 2016-02-11. ^ a b Piggott 1968. p. 89. ^ Druides, Charlton T. Lewis, Charles Short, A Latin Dictionary, on Perseus project. ^ a b c d e Caroline aan de Wiel, "Druids  the word", in Celtic Culture. ^ Δρουίδης, Henry George Liddell, Robert Scott, A Greek-English Lexicon, on Perseus. ^ Pokorny's Indogermanisches etymologisches Wörterbuch, see also American Heritage Dictionary (4th ed. ), Δρυίδης. ^ Proto-IE *deru-, a cognate to English tree, is the word for "oak", though the root has a wider array of meanings related to "to be firm, solid, steadfast" (whence e.g. English true). The American Heritage Dictionary of the English Language. Fourth Edition, 2000 Indo-European Roots: deru-. ^ The American Heritage Dictionary of the English Language: Fourth Edition, 2000 Indo-European Roots: weid-. ^ δρῦς, Henry George Liddell, Robert Scott, A Greek-English Lexicon, on Perseus project. ^ List of ancient Greek words ending in -ιδης, on Perseus. ^ See further Brian Ó Cuív, "Some Gaelic traditions about the wren". Éigse 18 (1980): pp. 43–66. 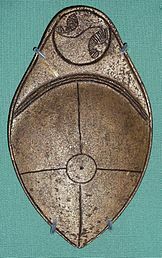 ^ There are nine surviving gorget collars, seven in the National Museum of Ireland, all dating from the late Bronze Age, 800–700 BCE. Wallace, Patrick F., O'Floinn, Raghnall eds. Treasures of the National Museum of Ireland: Irish Antiquities, 2002, Gill & Macmillan, Dublin, ISBN 0-7171-2829-6, pp. 88–89, 100–101. ^ a b c Caesar, Julius. De bello gallico. VI.13–18. ^ Hutton 2007. pp. 44–45. ^ Reports of druids performing human sacrifice are found in the works of Lucan, Pharsalia i.450-58; Caesar, Gallic Wars vi.16, 17.3-5; Suetonius, Claudius 25; Cicero, Pro Font. 31; Cicero, De Rep. 9 (15);cited after Norman J. DeWitt, "The Druids and Romanization" Transactions and Proceedings of the American Philological Association 69 (1938:319-332) p. 321, note 4. ^ Rives, J. (1995). "Human Sacrifice among Pagans and Christians" in Journal of Roman Studies, p. 85. ^ Chadwick 1966. pp. xviii, 28, 91. ^ a b Diodorus Siculus. Bibliotheca historicae. V.21–22. ^ Donald A.Mackenzie, Buddhism in pre-Christian Britain (1928:21). ^ Isaac Bonewits, Bonewits's Essential Guide to Druidism, Citadel, 2006. ^ Heroic Romances of Ireland. I. Sacred-texts.com. Retrieved December 24, 2011. ^ "Drui". Dictionary of the Irish Language (eDIL). Royal Irish Academy (RIA). Retrieved 11 February 2016. 1c: "dialt feminine declension, Auraic. 1830. bandruí druidess; female skilled in magic arts: tri ferdruid ┐ tri bandrúid, TBC 2402 = dī (leg. tri) drúid insin ┐ a teóra mná, TBC² 1767." ^ a b Parkes, "Fosterage, Kinship, & Legend", Cambridge University Press, Comparative Studies in Society and History (2004), 46: pp. 587–615. ^ a b Jones, Mary. "The Boyhood Deeds of Fionn mac Cumhaill". From maryjones.us. Retrieved July 22, 2008. ^ T. W. Rolleston, Myths and Legends of the Celtic Race, 1911, pp. 109–112. ^ Piggott 1975. p. 91. ^ Piggott 1975. pp. 91–92. ^ Piggott 1975. p. 92. ^ a b Aldhouse-Green 2010. p. xv. ^ Diogenes Laërtius. Vitae. Introduction, section 1. ^ "Diogenes Laërtius Lives of the Philosophers: Thales, translated by C.D. Yonge". classicpersuasion.org. ^ Twenty references were presented in tabular form by Jane Webster, "At the End of the World: Druidic and Other Revitalization Movements in Post-Conquest Gaul and Britain" Britannia 30 (1999:1–20):2–4. ^ de Coulanges, Fustel (1891). La Gaule romaine. Paris. Page 03. ^ Hutton 2009. pp. 04–05. ^ Dunham, Sean B. (1995). "Caesar's Perception of Gallic Social Structures" in Celtic Chiefdom, Celtic State (Eds: Bettina Arnold and D. Blair Gibson). Cambridge: Cambridge University Press; endorsed by Maier, Bernhard (2003). The Celts. Edinburgh: Edinburgh University Press. Pp. 65–66. ^ Nash, Daphne (1976). "Reconstructing Posidonius's Celtic Ethnography" in Britannia 7. Page 126. ^ Creighton, "Visions of power: imagery and symbols in Late Iron Age Britain" Britannia 26 (1995: pp. 285–301; especially p. 296f). ^ e.g. Jane Webster, in "At the End of the World: Druidic and Other Revitalization Movements in Post-Conquest Gaul and Britain" Britannia 30 (1999: pp. 1–20 and full bibliography). ^ Hutton 2009. p. 05. ^ Rutherford 1978. p. 45. ^ "Drui". Dictionary of the Irish Language (eDIL). Royal Irish Academy (RIA). Retrieved 11 February 2016. ^ Kelly, A Guide to Early Irish Law, pp. 59–60. ^ Kelly, A Guide to Early Irish Law, p. 60. ^ Hutton 2009. p. 47. ^ British Museum collection database, "spoon, 1856,0701.1369". ^ Fitzpatrick, A.P. (1996). "Night and Day: the symbolism of astral signs on Late Iron Age anthropomorphic short swords". Proceedings of the Prehistoric Society. 62: 373–98. doi:10.1017/s0079497x0000284x. ^ Anne Ross (1986). "Lindow Man and the Celtic tradition", in Lindow Man; The Body in the Bog (eds: I.M. Stead, J.B. Bourke and D. Brothwell), pp. 162–69. ^ Anne Ross and Don Robins (1989) The Life and Death of a Druid Prince. ^ "The Druids". 20 September 2012. ^ Freeman, Phillip, War, Women & Druids: Eyewitness Reports and Early Accounts, University of Texas Press, ISBN 978-0-292-72545-4, pp. 49–50. ^ The modern career of this imagined connection of druids and Stonehenge was traced and dispelled in T. D. Kendrick, The Druids: A Study in Keltic Prehistory (London: Methuen) 1927. ^ Tatham is quoted by C. H. Collins Baker, "William Blake, Painter", The Huntington Library Bulletin, No. 10 [October 1936:135-148] p. 139. ^ Norman J. DeWitt, "The Druids and Romanization" Transactions and Proceedings of the American Philological Association 69 (1938:319–332): "Few historians now believe that the Druids, as a corporation, constituted an effective anti-Roman element during the period of Caesar's conquests and in the period of early Roman Gaul;" his inspection of the seemingly contradictory literary sources reinforced the stated conclusion. ^ "Price, William, Dr, (Llantrisant), papers". Archives Network Wales. May 2003. Retrieved 2006-09-27. ^ Powell 2005. p. 3. ^ Hutton 2009. p. 253. ^ T. D. Kendrick, The Druids: A Study in Keltic Prehistory (London: Methuen) 1927. ^ Piggott 1968. pp. 92–98. ^ Ross 1967. pp. 52–56. ^ Aldhouse-Green 1997. pp. 31–33. ^ Cunliffe 2005. pp. 518–520. Cicero. De Divinatione. 44 CE. Pliny the Elder. Naturalis Historia. c.78 CE. Tacitus. Annales. Second century CE. Aldhouse-Green, Miranda (1997). Exploring the World of the Druids. London: Thames and Hudson. Chadwick, Nora (1966). The Druids. Cardiff: University of Wales Press. Cunliffe, Barry (2005). Iron Age Communities in Britain: An account of England, Scotland and Wales from the seventh century BC until the Roman Conquest (Fourth Edition). London and New York: Routledge. ISBN 978-0-415-56292-8. Hutton, Ronald (1991). The Pagan Religions of the Ancient British Isles: Their Nature and Legacy. Oxford: Blackwell. ISBN 0-631-18946-7. Hutton, Ronald (2009). Blood and Mistletoe: The History of the Druids in Britain. New Haven, Connecticut: Yale University Press. ISBN 0-300-14485-7. Rutherford, Ward (1978). The Druids and their Heritage. London: Gordon & Cremonesi. ISBN 978-0-86033-067-7. Ross, Anne (1967). Pagan Celtic Britain. London: Routledge. Piggott, Stuart (1968). The Druids. London: Thames and Hudson.